This building was constructed in 1886 as an extension of the business empire of John Koster and Albert Bial, whose concert halls around the corner on 23rd St. formed the hub of an entertainment district centered at 6th Ave. and 23rd St. from the late 1870s into the 1890s. On May 5, 1879 John Koster (1844-1895) and Albert Bial (1842-1897) opened their first concert hall on 23rd St. near the corner of 6th Ave. at the theatre previously known as the Hudson Metropole. Music programs were presented in the German style of a beer garden with food and drink part of the offerings. The complex included an open-air garden as well as an enclosed theatre. In 1881 they opened a second concert hall at 115-117 W. 23rd St. adjoining the older building. The new structure boasted 1200 seats fitted up as a vaudeville theatre. In 1887 Koster & Bial abandoned their original building, leasing it to Alfred Reichell of the New York Amusement Co. A print showing Koster & Bial's Concert Hall in 1892 appears in the New York Public Library's Digital Collections. There is also a print of the interior of the Koster & Bial Theatre from the NYPL Picture Collection. In 1892 Moses King wrote the following in his Handbook of New York City: "Koster and Bial's Concert Hall, at 115 West 23d Street, is a high-class vaudeville theatre and a beer-garden. The entertainments are of the vaudeville or variety order, like those given at the Alhambra in London, and the Eldorado in Paris, with a burlesque to lead the programme, and are given without the use of a curtain. The property is owned by Alfred B. Darling, who is also the owner of Proctor's Theatre, and is one of the senior proprietors of the Fifth-Avenue Hotel." In 1893 Koster and Bial left 23rd St. altogether, and bought the Manhattan Opera House (from Oscar Hammerstein, Sr.) at 145-147 W. 34th St. This was remodeled as a more extensive concert hall and renamed Koster & Bial's. Yet another photo from the New York Public Library shows a Koster & Bial's sign at the 34th St. location. This is a photo ascribed to the Brown Bros. and is dated 1896 (click for image). It was in the Koster & Bial's on 34th St. that Thomas Edison gave his first public demonstration of his Vitascope movie projector, April 23, 1896. A plaque (click for image) on the site (occupied by Macy's Dept. Store since 1901-02) proclaims this event as the first projection of a moving picture. The Lumière brothers, however, might take exception to this claim. The first screening of their film "La Sortie des Ouvriers de l'Usine Lumière" took place in Paris on Dec. 28, 1895 at the Grand Café on the Blvd. des Capucines. An image of Koster & Bial's on 34th Street appeared in the New York Daily Tribune 17 July 1901 when Macy's announced that they had purchased the property. Koster & Bial were both born in Germany in the 1840s and immigrated to the US in the early 1860s. The two men met, apparently for the first time, in 1869 when Koster hired Bial to work for him in his restaurant at Park Row and Worth St. A year later Bial and Koster became partners in a restaurant on the East Side. Soon afterward they opened other restaurants in the area. In 1873 they entered the beer-bottling business, and in 1875 they opened a restaurant in the Tribune Building near City Hall. Their music hall enterprises began in 1879. This portrait of Albert Bial appeared in Moses King's Notable New Yorkers of 1896-1899 (1899). The building above at the corner of 24th St. (its address in 1886 was 389 Sixth Ave.) was constructed beginning 4 June 1886 and completed 25 Jan. 1887. It served as a saloon and a retail outlet for the beer bottling business. The architects were Herman J. Schwarzmann and Albert Buchman, who designed several prominent New York buildings, including the New York Mercantile Exchange (click for image) at 628 Broadway (Schwarzmann with Buchman and Benjamin Deisler, 1882) and the New York Edison Co. Building at 121 E. 12th St. (Buchman & Deisler, 1896). A print showing The Corner in 1892 appears in the New York Public Library's Digital Collections. Another print with the same date shows a Koster & Bial at 200 Worth St., on the corner of Park Row (click for image). This print is called a "souvenir" and probably represents Koster & Bial at a much earlier time than 1892. Another print in NYPL's Digital Gallery shows Koster, Bial & Sander at 75 Chambers St. in 1892. This seems to have been a beer hall / saloon in business approximately 1892 to 1896. Another NYPL print shows the bar and interior of this establishment. The digital collections at the Museum of the City of New York show several views of Koster & Bial's on 34th St. near Broadway including some interiors. 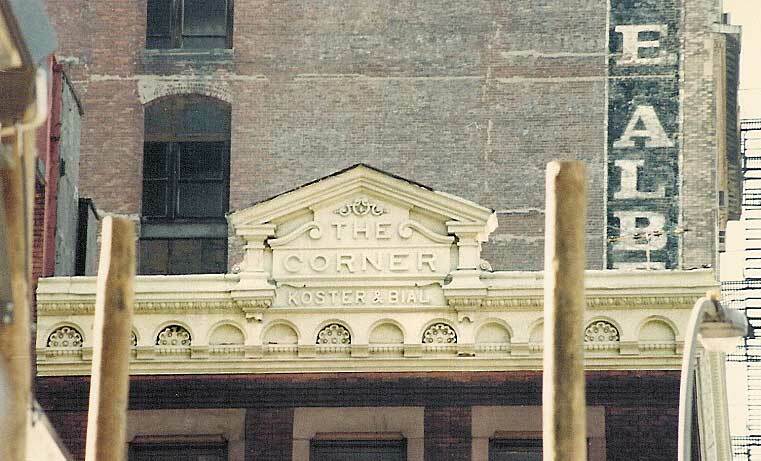 By 1894 ownership of "The Corner" had passed to the estate of one Josiah Belden. NYC Dept. of Buildings records indicate that at this time the building was occupied by "Store, Billiard and Lodge Rooms."